Whether you choose from our extensive catalog of designs or bring your own thoughts to the drawing board, our full-service construction and project management team will make sure your finished product reflects our years of experience and your personal taste. We don't have a special room where we make new homes and new commercial buildings come to life. Our success lies in a great group of people who bring their talents to the table like an 11-course meal. And everything starts when the customer pulls up a chair. OUR SKILLS GO BEYOND THE BLUEPRINT. We're here to turn your designs into your favorite spaces. I’ve been involved in real estate for 16 years. During that time, I've been busy building single family homes, as well as developing two local town home communities. I also have commercial experience in historic renovation, tenant build outs, and office and retail development. Passionate about the construction process, I am constantly on the lookout for the latest building design trends as well as creating a few of my own. I believe in an open and collaborative building process, stemming from a love for design grown from function, need, neighborhood dynamics, and budget. A farm kid from Pender, Nebraska, I graduated from the University of Nebraska with a Bachelors of Science in Business Administration. I credit a lot of my success to strong family values, a strong team, and a few strong cups of coffee. As the Chief Operating Officer of Kelly Construction, I oversee projects and make sure everything gets done right, on schedule, and as planned. I’m also deeply involved in all office operations. It’s a busy role, but somebody has to keep this ridiculously talented team on their toes. They make it easy to love my job and, in turn, I make it easier for them to do theirs. 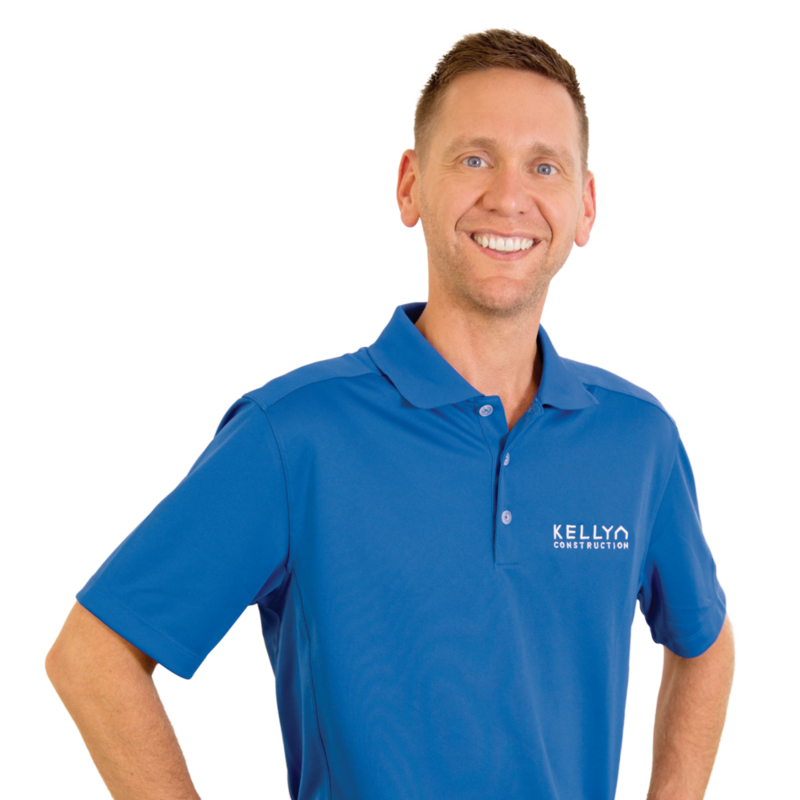 I received my Bachelor of Arts degree from Briar Cliff University in Sioux City and worked for 11 years in the financial industry before joining the Kelly team in 2006. I’m the Operations Manager for Kelly Construction, and that basically means I am involved in the day to day office operations and making sure all of our teams are fully supported so they can consistently deliver to our impressive standards. I love taking a blank slate and turning it into something amazing; there’s just nothing like watching that the final piece of the finished product fall into place. When I’m not managing projects and wrangling deadlines, I love chasing after my young kids with my wife, cheering for the Vikings during football season, and spending time in the great outdoors with my family. With over 20+ years’ experience in building custom homes, I am grateful to have helped over 300 people and families create the houses of their dreams. Seeing the customers enjoy the final product is the most rewarding part of the entire experience; I love the creativity it takes to turn wishlists into a reality and blueprints into a home. I grew up in Odebolt, Iowa and received my Associate’s Degree in Construction and Architectural Engineering from Western Iowa Tech. I loved the Siouxland area so much that I decided to stay, putting down roots here with my two boys while I work on projects and cheer on the Tennessee Titans. Since 2002, I have been overseeing the construction in homes from start to finish. I have been in the construction industry since the age of 16. I really enjoy working with the clients on a day to day basis to make sure their needs are being met and they are completely satisfied with the final product. I have also involved in the commercial side of construction. I grew up in Omaha, Ne. My wife Tammy and I moved to Tekemah, NE about 20 years ago to enjoy time with family. I like to hunt, fish and golf in any spare time. Stephanie is a creative who believes in the power of beautiful interiors to transform daily life. She attended Minnesota State University, Mankato to major in Interior Design with a Marketing minor. Stephanie also became an Accredited Home Stager through The Haverhill Institute of Design and Staging. She has a well trained eye for creating polished spaces that are functional, friendly and beautiful. Her aestetic is classic with a twist and timeless with a hint of edge. She prides herself on attention to detail and a true love for what she does! I have been designing and furnishing homes and businesses in Siouxland for over six years and find that I enjoy the work more each day. Thompson Interior Design is a full-service interior design boutique specializing in custom and original interiors with a mix of classic, modern, and casual style. I love creating spaces are both on trend and on target, and I work with clients to create enduring style that creates interest while leaving a lasting impression. Our partnership with the accomplished Kelly Construction team has given homeowners the ability to realize their dream homes from fixtures to flooring and everything in between. When I’m not rifling through fabric swatches or designing spaces for Kelly Construction, I’m hanging out with my husband Dan, and our two darling daughters in Sioux City, Iowa.